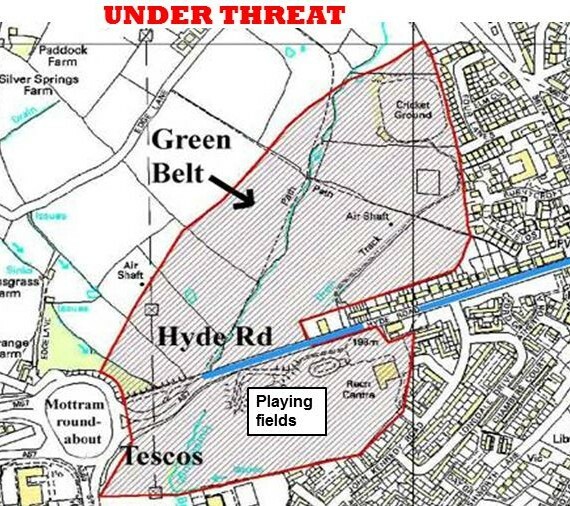 The Green Belt north of the A57 Hyde Road plus the playing fields south of Hyde Road are earmarked for industry and distribution. This is part of the council’s strategic plan for Mottram. The community said a huge NO! A record high num-ber of 517 residents wrote to the Council to object to these plans. The Council reassured us this would not happen—until there was a by-pass. Suddenly there is an expectation that the Mottram by-pass-Glossop spur will be built during the next Parliament. So, the concreting of Mottram looms closer! The community’s overwhelming “no” to these plans means we don’t want an industrial estate, whether or not there is a by-pass! But the Council is stalling on sending the plans forward to HM Planning Inspectorate. This leaves Mottram vulnerable to speculative developers. New planning laws allow development that is unprotected by a strategic plan. Other boroughs, such as Stockport, have their strategic plan in place, offering some protection to prime land.